Foothills, montane, subalpine. Meadows. Summer. Top and left: The Meadows below El Diente, August 1, 2008. 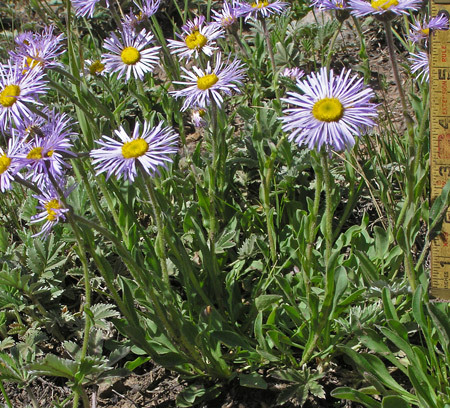 Because Erigeron formosissimus grows from spreading underground roots, it covers large areas and is quite showy. Most basal clusters of leaves that arise from these roots do not produce flower stems but enough do to make the plant quite noticeable. The flowering stems arch outward and then upward (see bottom center of photograph at left) in a characteristic and diagnostic manner. Stems eventually grow to 6-14 inches tall and are generally topped by just one flower head, but they also can have several flower heads that branch from the main stem a few inches below the upper flower. Stem leaves are appressed and considerably shorter than the basal leaves. Erigeron formosissimus is a handsome and showy plant which can, from a distance, be confused with a number of other Erigerons, especially its taller cousin, Erigeron speciosus. Take a close look. Erigeron formosissimus was first collected for science by Elmer Wooton in New Mexico and it was named by Edward Greene in 1898. "Formos" is Latin for "graceful, beautiful" and with the Latin male superlative ending of "issimus" (feminine is "issima" and neuter is "issimum") the word "formosissimus" means "most graceful and beautiful". The Meadows below El Diente, August 1, 2008. 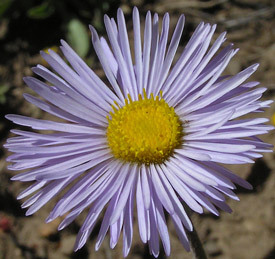 As is true of almost all Erigerons, this Erigeron has numerous, very narrow ray flowers and phyllaries of equal length. 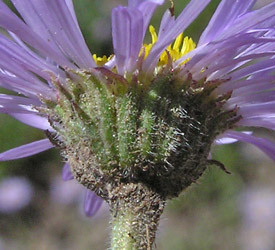 Notice that these phyllaries are slightly curved back at their tips, slightly purple, slightly hairy, and slightly glandular (sticky) as evidenced by the sand particles clinging to the phyllaries. Basal leaves (immediate left top photograph) are in clusters of 6-12 and there are many clusters in closely packed communities. Leaves are cupped inward, several inches long, and horizontal to vertical. 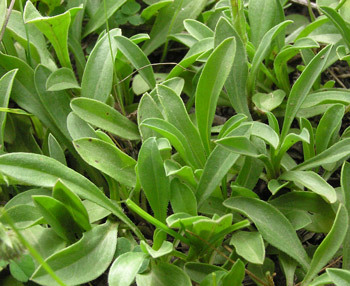 Stem leaves are commonly vertical, shorter than the basal leaves, and sessile (stemless).